Life hack: This thing is also great for storing eyeshadows, washi tape, and sprinkles. If you've ever spent time in a kitchen, you've probably opened up a spice cabinet just to find a cluttered mess — and not the one spice you're actually looking for, of course. Even if you're an organized weirdo like I am, spices can be really dang hard to keep in place. And being on the shorter side, if a spice winds up in the back of the cabinet, it's farewell and goodbye to that spice — I will never see it again. 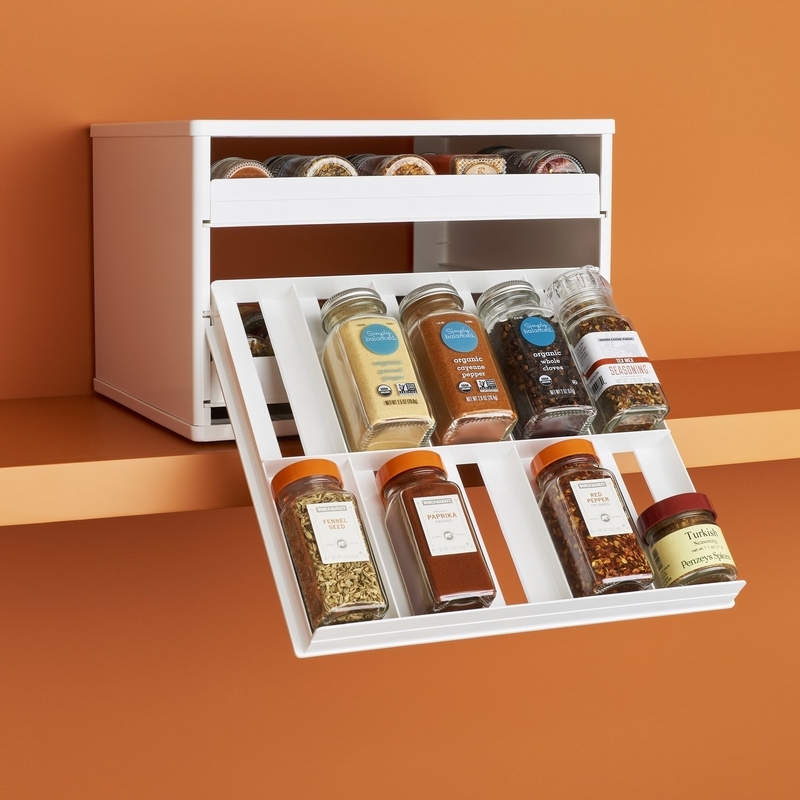 That's why this fancy pull-down spice rack ($20) is an organizer's dream, and I am going to prove it to you. 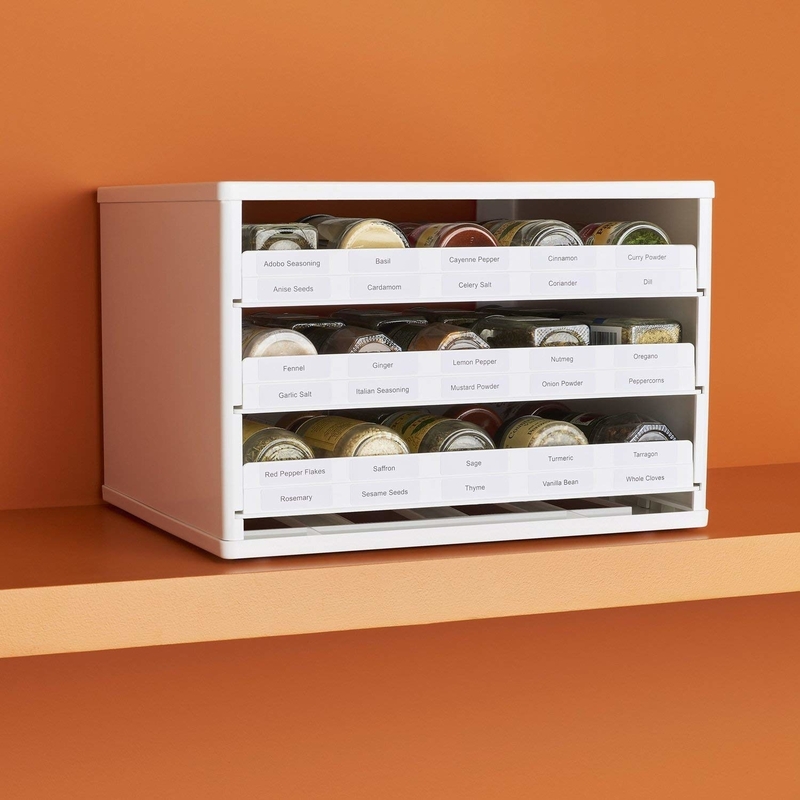 It even comes with 48 pre-made labels for common spices, and 48 blank ones you can label on your own. Not only that, but it comes in different sizes that can accommodate 12, 18, 24, and 30 bottles. This company really thought of everything and it brings tears to my eyes. Evidence piece #1: This thing has over 3,000 reviews and a 4.7-star rating on Amazon. Honestly, I don't know anything on Amazon with ratings like that and perusing Amazon.com is basically my entire job! Evidence piece #2: The pull-down feature helps you easily find whatever you're looking for. Now you can actually remember to use your smoked serrano chili powder that's been sadly neglected in the back! "The racks are fantastic. I love them to death. They're great overall, and it really helps short people like me since I can't see into the cabinets well (I have them on the second shelf), and this angles everything down (though the labels on the front of the drawers tell me all I need to know!). I love everything about my purchase, and I love this company." —Danielle C.
Ok, I'm done with entering evidence into the court of organization. These photos speak for themselves! These can be used for more than just spices, too — like say, SPRINKLES! Everything is just *so* organized... I think this may the most functional organizer I've ever laid my eyes upon. Well, if you couldn't tell already, I am ready to ORGANIZE! Get it from Amazon for $19.99+ (available in four sizes and two colors).